In a bowl, throw in all ingredients and whisk for a couple of minutes until everything is blended well together. Let this settle for at least 2-3 hours or overnight. Serve in a small glass jar with fruit of your choice on top! I went for a raspberry and shredded coconut as my toppings. 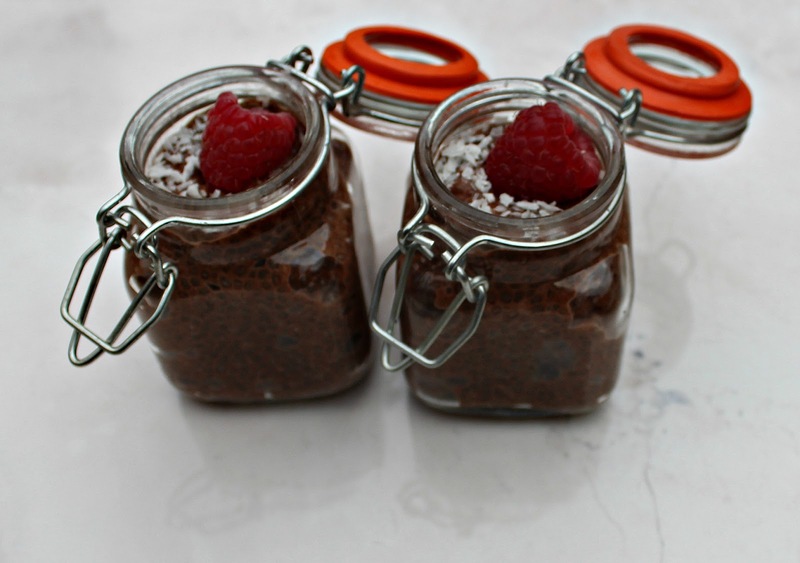 Chia pudding serves up as a fabulous clean dessert or an afternoon pick me up or even an alternate to regular breakfast items. Plus the fact that it takes literally minutes to make is an added bonus. Chia seeds are a rich source of calcium, protein and omega 3 fatty acids. They also have many other health benefits such as improving heart health & combating diabetes to name a few. If you have or are thinking of going vegan, you should most definitely add chia seeds into your diet. And I think it cannot get better than eating chia seeds in pudding form! If you don't fancy the jelly-like texture of chia seeds, you could blend this into a smooth paste in your blender.